2Work Black Wheelie Bin Liners Medium Duty (Pack of 100) 2W01167 Pack of 1 Medium Duty Bin Liners. Designed to fit most wheelie bins. Black polythene construction. Supplied in a flat pack of 100. Dimensions: 762x1140x1370mm. Capacity: 270 litres. 2Work Clear Polythene Bags On a Roll (Pack of 250) 2W06255 Pack of 1 Refuse Sacks. 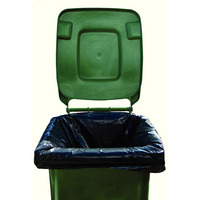 Clear plastic sacks suitable for bagging up rubbish and other waste material. Medium duty. Size: 381 x 711 x 990mm roll. Capacity: 90 litres. 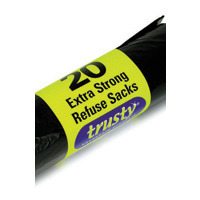 2Work Black Medium Duty Extra Strong Refuse Sacks (Pack of 600) 2W81012 Pack of 1 Extra strong refuse sacks. Designed for heavy duty use by caterers and cleaners. Made from tough polythene. 20 rolls with 30 sacks per roll - ideal for bulk users. Black. 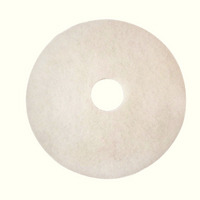 3M Economy 380mm White Floor Pads (Pack of 5) 2ndWH15 Pack of 5 Recommended for polishing, these White Economy Pads feature a special fibre mix that improves floor shine. 3M Economy 430mm White Floor Pads (Pack of 5) 2ndWH17 Pack of 5 Recommended for polishing, these White Economy Pads feature a special fibre mix that improves floor shine.